After 3 years of autocross, I finally did my first track day a few weeks ago at Thunderhill Raceway. Despite its similarity to going autocrossing and hanging out at Infineon for LeMons, it was definitely a unique experience. The driving helmets are certainly familiar, although the girl above used an interesting technique to clean the visor. Notably different, though, were some of the other safety practices when driving on the track. 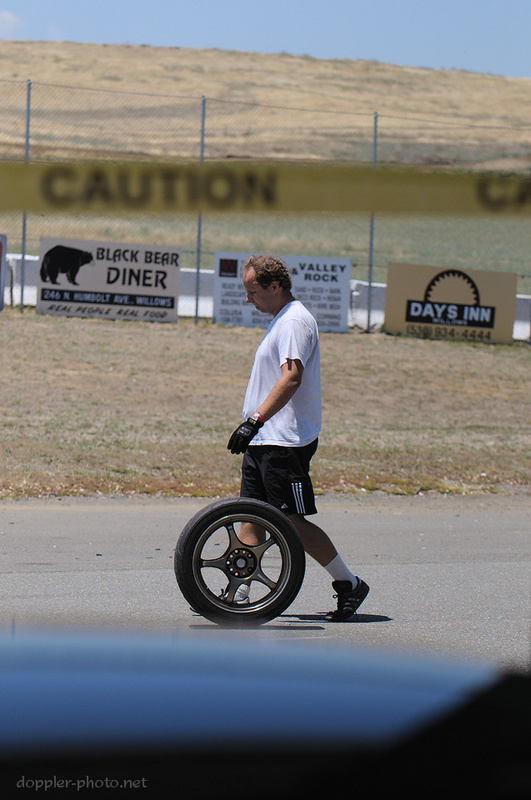 I had noticed a few of them at Infineon, but they were much more obvious when it was actually me behind the wheel. Tires. Autocrossers tend to be a bit obsessive about tires, but folks on the track take it to another level, and for good reason. If you take a corner too fast at an autocross, you take out some cones; no big deal. At a track, you can end up totalling your car and being seriously injured in the process — a car at 120mph has 9 times the kinetic energy of a car at 40mph. Furthermore, the sustained speeds and cornering loads tend to put a significant amount of heat into the tire, which contributes to significantly accelerated tire wear at the track. So much so, in fact, that Thunderhill has an onsite tire store, which is where the guy above is headed after experiencing some uneven tire wear. To quantify the difference a bit, I'll typically inflate my cold tires to around 40PSI for an autocross, and they'll reach about 44PSI warm. At the track, I started off at 34PSI cold and ended up at max of around 45PSI (at which point I let some air out of the tires). Collision safety. 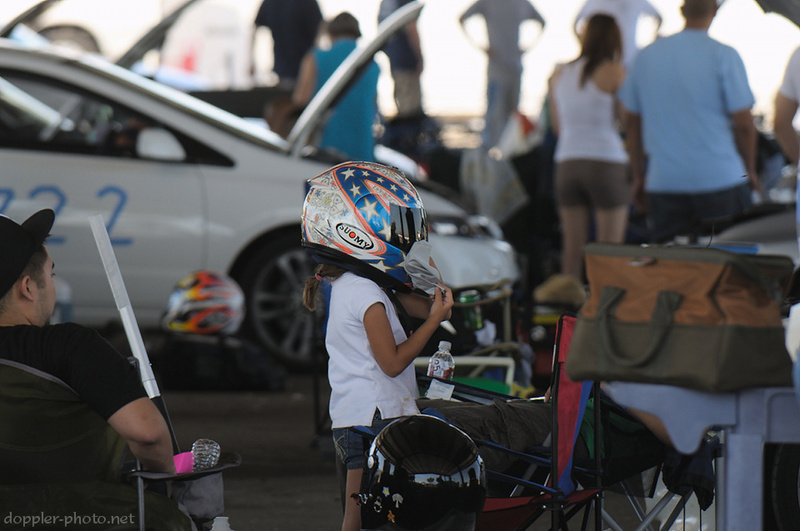 At an autocross, the focus is typically on the safety of the cone-workers who are running around on foot. For a well-designed course, it's difficult to actually get to and hit an immobile obstacle, and in the rare case that it happens, it's generally at low speed. On a track, it's a lot easier. Also, hitting an immobile obstacle while belted in properly can cause a driver's body to decelerate so quickly as to cause a basal skull fracture, which is in many cases fatal. 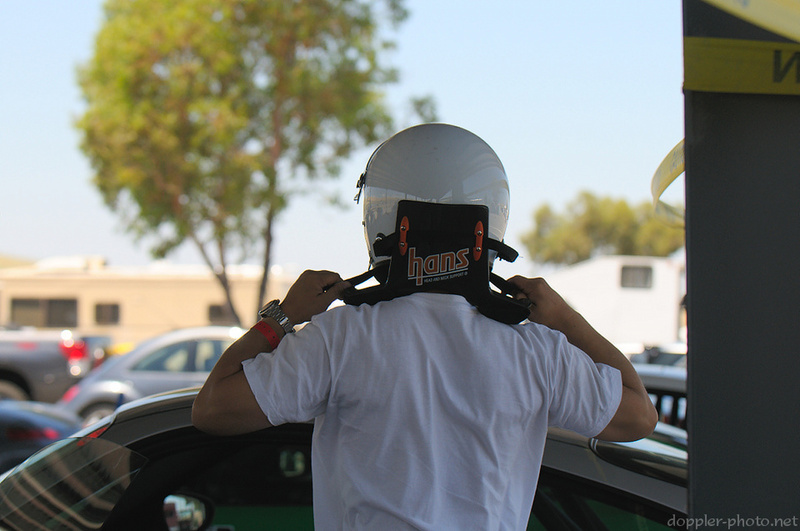 The HANS device and other devices like it are designed to keep the driver's head from whipping forward in a collision, specifically to avoid that fate. These devices are mandatory in many racing leagues since the death of famed NASCAR driver Dale Earnhardt in 2001, who suffered a basal skull fracture when his car crashed into the outer wall of a circuit at high speed. The emphasis on safety is, of course, well-warranted. Events or conditions outside of a driver's control can easily find them headed in the wrong direction. In the case above, an earlier car had dropped oil across an off-camber turn on the track. The Spec Miata racers discovered the oil when they immediately began sliding off-course. 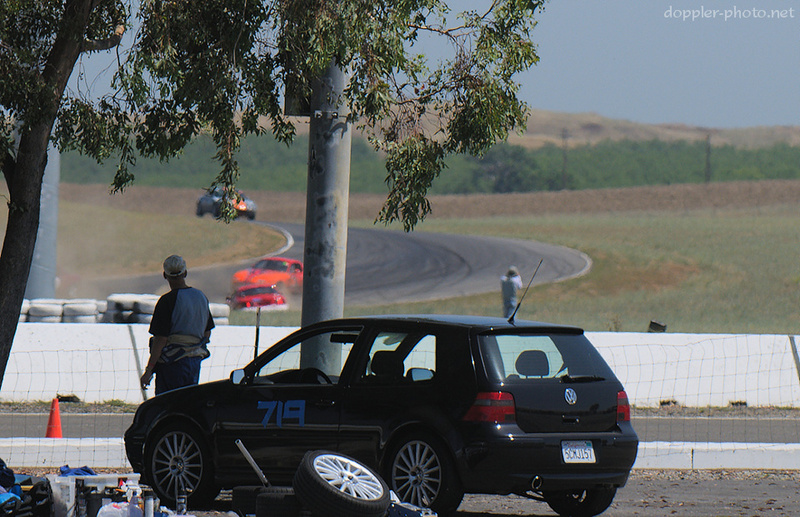 All in all, though, my visit to Thunderhill was a great experience, and I look forward to my already-planned return. Click here to check out the rest of the photos.